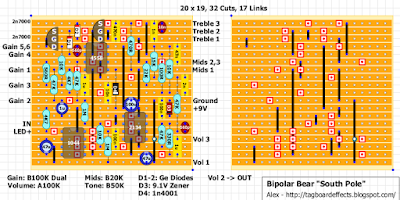 I see the 2n cap, in the middle filter of the South drive, is surrounded with two 10k resistors, whereas in the schematic I have found on David Rolo's site, the resistor after that 2n cap is a 15k. Not sure if I have the right schematic...? I've got the European time advantage! Are there pcbs for this one or the gogweed? nope. nor are there any for some of the other crazy effects like the liquid mercury or twin peaks. There is actually a group buy going on over at the madbean forum for the Liguid Mercury (Phaser), Twin Peaks (Tremolo) and the Giant Hogweed (Octave up/down fuzz). It ends on the 31st so everyone better hurry to get those PCBs! Whooo thanks, just made it to madbean in time!!! Getting some wacky looking voltages. The +/- voltage drops from +9/-9 with each IC installed. Ends up at +6.44/-5.95. The South Pole seems to be working, the North pole is not. Looking over the North Pole schematic, seems strange that only VB is applied to the circuit, I don't see 9V applied anywhere. Maybe the drains of T1, T3 and T5 should tie to 9Vs? Well, after reviewing some similar muamp style schematics, BSIAB, DLS, I went ahead and applied 9Vs to the T1,T3, and T5 drains and now I have output! Seems like all the controls are working but the volume is a bit under unity even with both Gain and Volume controls maxed. Maybe there is something else amiss with the schematic? Nope, bad J201 causing low output. Replaced, now the thing cranks! I think the Mids control is wired backwards though. I'm still only getting about +/- 6 volts from the charge pump with the south pole ICs installed. Without the ICs, I get +/-9Vs (Tried LT1054 with pin 1 lifted too). So there may still be an issue with the supply. So, I believe the layout needs updating to supply 9Vs to the drains of North Pole's T1, T3 and T5 and the MIDs control wires may need to be flipped. Alex, I believe there needs to be a connection between the T1, T3, and T5 drains and the junction of 120R, 22k, 100u and 100n. The N. Mids pot seems to be backwards too. I need to remove the cut right above 1044 pin 1 and fix the "North Pole" layout. Won't be able until Sunday cause I'm away and I don't have the original DIYLC file with me. Still it doesn't explain your 1044 voltages. Something wrong with your components? I built this at the weekend also and mine doesn't work either. I went over mine many times and couldn't find a problem with the build. Mike i looked at your fix but the image seems to have shifted somehow. 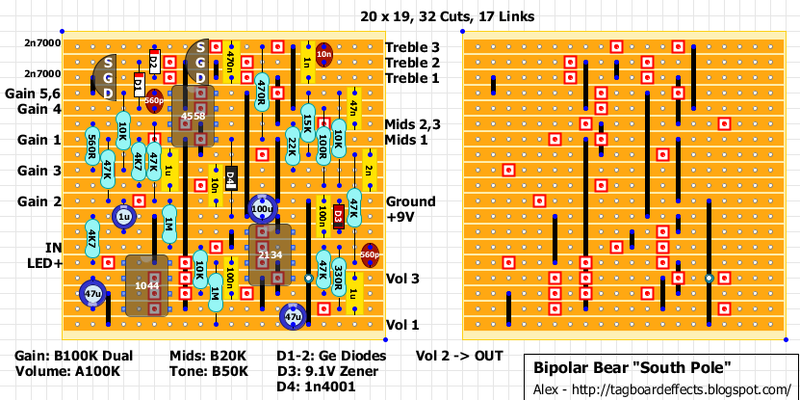 Alex, it looks like removing the cut above the 1044 would probably work, but that would be tapping off the SP supply, and for some reason my SP voltages are a bit low. I posted some changes which allows tapping off the NP supply, before the 1044 which still reads 9vs for me. Not sure why my SP voltages are so low. Will look it over again tonight. Gavin, I had to add a wire across the board to correct mine, I didn't see any other way of implementing a fix since the board was already cut and populated. I soldered a wire to the bottom of the 22k resistor (the 22k at the furthest bottom right of the board, next to the 120R) and the other side of the wire went to the pad just above the same 22k resistor. Could you do me a favor and post the voltages you have on your ICs? I've found another way by moving one cap, one resistor and adding one link but I can't change until the next weekend. What are the voltages after each 120R resistor from the +9V? I was getting close to 9Vs on the NP side and about 6.4Vs on the SP side, measured right at each 120R resistor. If I pulled either the 2134 or 4558, didn't matter which, the SP voltage increased above 7Vs, and if I pulled both ICs, then it went up close to 9Vs. Not sure what type of issue that indicates. I couldn't find anything wrong with component values or placement. About the same readings with a LT1054 too, actually the LT1054 gave a little bit less voltage. Both effects are now working. I didn't get a chance to thoroughly test them out, but even with the lower voltage the SP definitely sounded like the OD820. Not sure what the NP sounded like, but it was good. Hoping to get back to it tomorrow night. "holy cow, I had never noticed the voltage drop ... I have the same on mine. The problem is R20 at 120 Ohm. It drops 2.5V ! You could either drop it to 33 or 22 Ohm and reduce the voltage drop significantly. Oh about the missing +9V label on the north pole schematic ... I seem to omit things that are obvious to me sometimes ... I am even surprised I did not forget the ground symbol for once ... ;-)"
Cool! Did you try jumpering the 120R resistor? Not yet, hopefully will get home earlier enough tonight. I now "see" your suggested layout changes, much easier than the changes I suggested. I'll probably take that post down, but leave the picture showing how to add the jumper wire for those who have already cut the original board. Worked as expected, I jumpered the SP 120R and now I have +9.1v and -8.74V. I may also swap out the 9.1v zener for a 12v zener since I'm using a TC1044. Let us know if the 12v Zener makes any difference! I'll change the layouts once I'm back home. I didn't notice any change, still quiet with a tiny increase in voltage. I'm a little concerned leaving in the 9v zener without a current limiting resistor though, as it would be conducting 100% of the time with a 9+ adapter. Not sure if that's an issue or not, I'll have to do some research. I do see Madbean suggests using a 9.1v zener when using a MAX1044 in the Road Rage, which also does not have a current limiting resistor, so I'd have to assume it's ok to go with the 9.1v. So I'm thinking a LT1054 or ICL7660 would be a safer choice for a charge pump. Again, I'm not an expert and could be off here. Hopefully someone with more electronics knowledge will chime in. PS: I agree with Michael Mids for the North pole is wired backwards: it should be N. Mids 1,2 -> N. Tone 3, and N. Mids 3 to the board, to the 15n cap. Both the board and the faceplate look great! I may have to give it a try without the Ge's too. Thanks Frédéric for verifying it! Alex any chance you can detail what changes to make as I built the original before the changes. Add the green link and sub the 120R resistor from pin 8 with a jumper. Thanks Alex. Realised after posting that Michael had updated his drawing so did just that. Now working. Cheers all. You'll just need to move a cap, then you can call your layout for the North Pole verified. Luckily, there is room up above, to send it to ground instead, simply moving the 1uF a tad to the right, and maybe also the 2.2nF to the left. The main board was correct.